Roomcast is designed as an all-in-one entertainment solution that allows guests to stream any content from their phone, tablet, or laptop - right to the big screen. 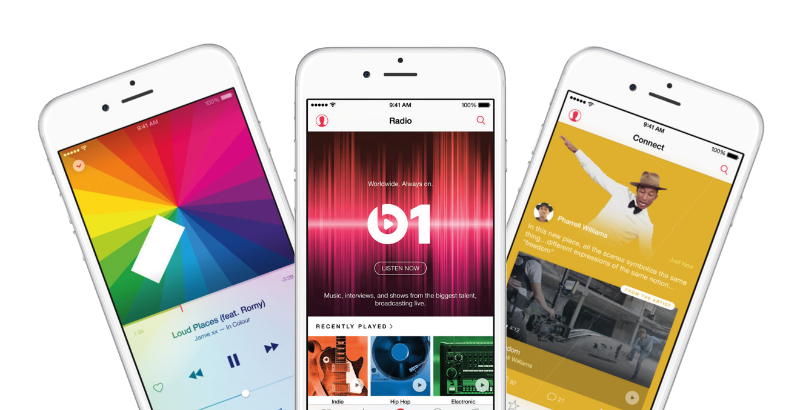 Do you have Apple Music subscribers? Make sure they don't get left behind with Bluetooth functionality built right in. This is just one of the many reasons that Roomcast is the most universally applicable in-room entertainment solution. 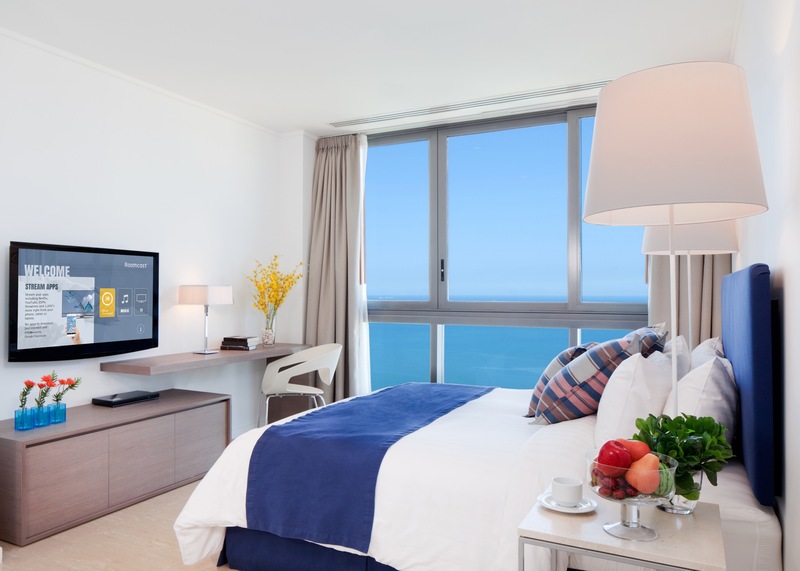 Roomcast provides MediaHub functionality as well; allowing guests to connect any devices they bring with them (e.g. Xbox, Playstation, AppleTV, Roku, etc.). TeleAdapt has a range of HDMI cable holder or flush-panels that make these guest device connections seamless and easily accessible. Designed for Roomcast the dial remote offers the best experience for the guest to navigate the on-screen menu. Guests will recognize the dial with logo and instructions printed on the top and instantly know that video casting service is available as soon as they enter in the room. Alternatively the small and easy-to-use hand held remote is another option for the guest room. 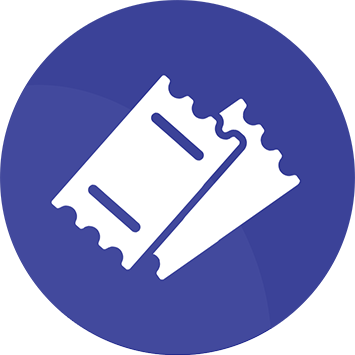 After joining the network, guests will discover the familiar "cast button" in all of their cast-enabled apps. There is nothing to download; no email or password to enter. Chromecast supports 1,000+ apps, 200,000 TV shows & movies, 30 million songs, plus radio, sports, games and more. Roomcast is compatible with the devices that guests travel with including iOS and Android phones and tablets; as well any laptop running the Chrome browser. "It's a simple, safe and secure way for guests to stream their favorite content right to their televisions. 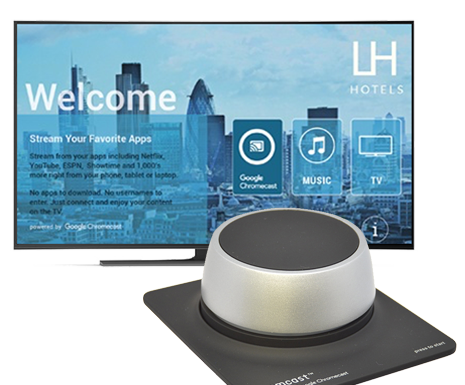 It's the future of in-room entertainment, now." 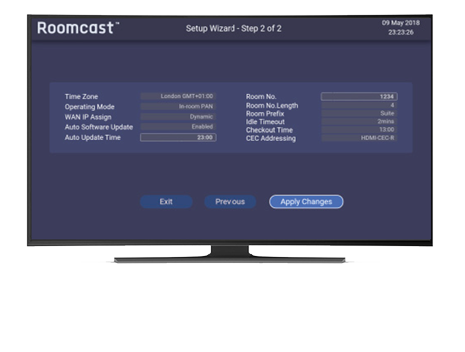 A custom UI service is available if you wish to customize the Roomcast menu and welcome screen on the TV. We can add your logo, your chosen background colour or image and button colours. *Extra Charge. Please ask for pricing on UI customization. Create your personal Roomcast Home. 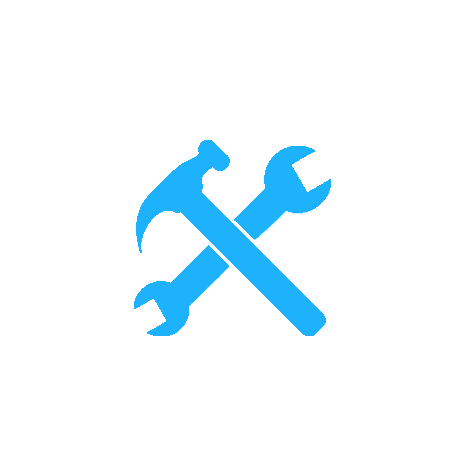 TeleAdapt will assign a system ID and PIN code for the property and provide a unique access to this central repository for Roomcast. • Although the Roomcast can be installed over Wi-Fi a wired Ethernet connection is preferred. The Setup Wizard steps through the key configuration parameters for Roomcast and runs only once, on initial startup. If setting up multiple units the parameters can be saved in a clone file on a USB drive for fast deployment. Our Helpdesk allows you to send a query seeking information or submit a Support request. Visit our new Downloads and Support Center to download everything you need for Roomcast. Can't find what you're looking for? Make sure you visit the Downloads and Support Center which has specification sheets, videos and more. keyboard_arrow_right What are the main components of Roomcast? Roomcast comprises a main unit (with an external in-line power supply) and a Roomcast remote which is available in 2 formats, push button or dial (dial available Q2 2017). In some situations it may be possible to utilize the existing TV remote in which case the Roomcast remote would not be required. keyboard_arrow_right What is supplied with each Roomcast? In the box there is a Roomcast main unit, an in-line power supply and a mounting bracket with screws. Separately you will also be supplied with an Ethernet cable, an HDMI cable and a power supply mains cable. Finally, depending upon the control method selected, you may also have a Roomcast remote control. This will either be a Roomcast Push-Button Remote or a Roomcast Dial. keyboard_arrow_right What are the pre-requisites for installation of Roomcast? Usually only three things are required for a Roomcast installation - a mains power outlet, a free HDMI port on the TV and a wired Ethernet wall jack with open Internet access. However in some situations this may vary, please contact your TeleAdapt representative for further help with your exact requirements. keyboard_arrow_right What are the mounting options for the Roomcast main unit? The Roomcast main unit will normally be mounted out of sight either behind the in-room TV or under a desk. Roomcast remotes use RF so they do not require line-of sight. The supplied Roomcast main unit mounting bracket is suitable for wall or under-desk mounting. keyboard_arrow_right What cabling is supplied with Roomcast? The standard Ethernet and HDMI cables supplied with Roomcast are approximately 3 feet (or 1 meter) long to support installation behind the TV. If the Roomcast is being mounted in a position where longer cables are needed or if additional cables are needed then please contact your TeleAdapt representative. keyboard_arrow_right What are the network requirements for Roomcast to work on my hotel network? Roomcast uses an open wired connection to the internet. Typically you will simply whitelist the MAC address of installed Roomcast devices. keyboard_arrow_right Is any equipment required in the server room? No. Roomcast is installed solely in the guest room. keyboard_arrow_right What if my hotel rooms don't have a wired internet port? If there are no wired ports in your hotel guest rooms, then using Roomcast in wireless client mode may be possible. Please contact your TeleAdapt representative for further help with the WiFi network requirements to support client mode. keyboard_arrow_right What are the requirements for a TV to be used with Roomcast? Roomcast works with almost any TV, but works best with hospitality TVs which are available from most major manufacturers. 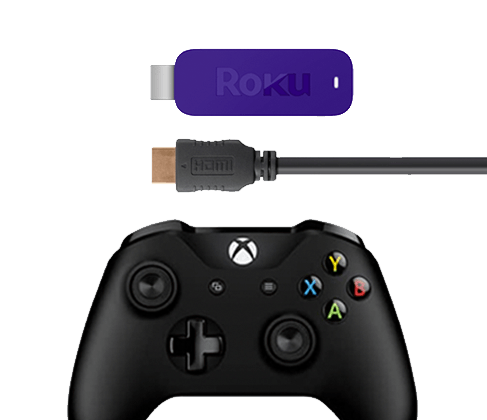 Your TV only requires a spare HDMI port for Roomcast to connect to. 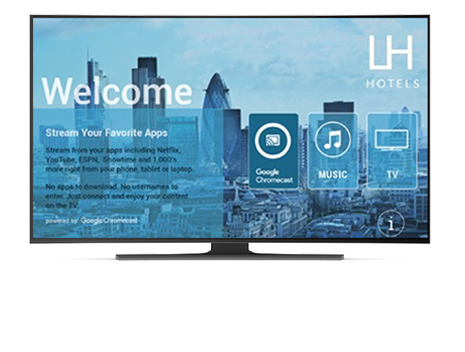 HDMI-CEC is the preferred method for automatic input switching and is available on most new hospitality TVs. Your TeleAdapt representative can advise to enable HDMI-CEC on your TV model. keyboard_arrow_right Does Roomcast work with an existing VOD / IPTV system? Yes, Roomcast is a perfect add-on to any existing VOD/IPTV system. 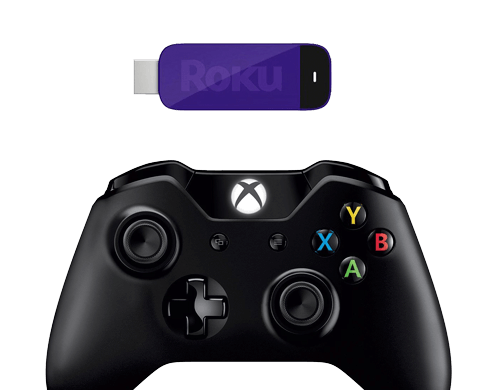 By connecting Roomcast to a spare HDMI port on the TV the Roomcast guest interface can be entered and exited with a simple press of the Roomcast remote control. keyboard_arrow_right What is the Roomcast Dial, and how does it work? The Roomcast Dial (available Q2 2017) is a unique remote control for Roomcast, designed to be engaging, and super simple to use. A press of the Roomcast Dial will switch the TV to display the Roomcast interface. Just rotate the dial to navigate and press to select the highlighted option. Exit to TV is always one press away. The Roomcast Dial is the simplest way to make it obvious to your guests, that your rooms are “streaming ready”. keyboard_arrow_right Can the Roomcast Dial be secured in the guest room? Yes, there are a number of options. The Roomcast Dial can accept a tether so it cannot be moved far from the desk. Alternatively we can supply a base for the Roomcast Dial which can be tethered to the desk. Then the Roomcast Dial can either be fixed to the base to prevent theft or simply placed on the base to deter theft. keyboard_arrow_right Does the guest need to download an app to use Roomcast? keyboard_arrow_right What apps work with Roomcast? The number of Chromecast-enabled apps is growing all the time so check Google's Chromecast Apps Directory for an up to date list. keyboard_arrow_right How do guests access their Netlix and other streaming media accounts? Guests use their own mobile apps and their own accounts. Guests never have to enter any login details such as user name or password into the Roomcast or the TV. The guest needs only to join the Roomcast WiFi network, open their app and cast. Guests also use their own device to make their media selections and to pause, play and rewind. keyboard_arrow_right How does Roomcast ensure only the guests in a particular room can access the Roomcast personal WiFi network? Roomcast generates a unique WiFi SSID and passkey which is presented to the guest on the in-room TV. Guests in other rooms have no way of knowing the passkey so the network is totally secure. keyboard_arrow_right When is the WiFi passkey refreshed? Roomcast can be configured with time out options to refresh the dynamic passkey at a specified time (for example every night at 3am). For other options (PMS driven refresh or similar) please contact your TeleAdapt representative. keyboard_arrow_right Can guests Cast content from a laptop computer? Yes, casting is a built-in feature of the the world's most popular browser, Chrome. The cast feature in the Chrome browser lets you cast what ever you see in a chosen browser window, including videos, photos, music and more. keyboard_arrow_right Does Amazon Prime Video work with Roomcast? Although the Amazon Prime Video app is one of the few apps that is not Chromecast-enabled, you can still cast Amazon content from a laptop using Chrome. keyboard_arrow_right What are the music streaming options available with Roomcast? 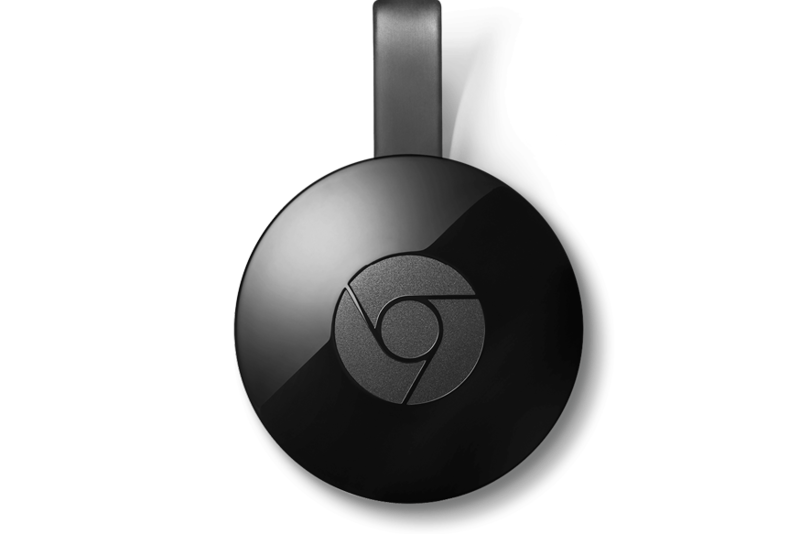 Chromecast supports Pandora, Spotify, iHeart Radio, YouTube Music and many other music streaming apps. Using these apps guests can simply cast their music stations or selections to the TV speakers while enjoying album art on the TV screen. Roomcast also supports a Bluetooth connection (available Q2 2017) which makes it possible for guests to stream music libraries native to their smartphone through the TV speakers. keyboard_arrow_right How can Roomcast help if a guest wants to use their own Xbox or Apple TV to the in-room TV? Roomcast has a guest HDMI port. When a guest connects their device the TV will automatically switch inputs and display the connected guest device. Furthermore the Roomcast personal area network makes it easy for these “browserless" devices to gain direct internet access. Ask the TeleAdapt team about our optional HDMI puck and panel accessories. keyboard_arrow_right How will Roomcast affect internet bandwidth requirements at a hotel? For each active HD video stream we recommend budgeting 5mbps bandwidth, this is in line with the estimates of providers like YouTube and Netflix. Assuming concurrent usage is 1 in 20 devices you can estimate the bandwidth required by dividing the total number of rooms by 4. So for a 100 room hotel you should budget on 25mbps plus whatever other bandwidth requirements you have. This figure may need reviewing in light of actual usage. It is important to note that it is extremely likely that guests are already wirelessly streaming content “unofficially” so the overall bandwidth increase may well be marginal. Further, because Roomcast uses the wired infrastructure to stream, the hotel wireless network should see wireless traffic decrease and wireless performance increase. keyboard_arrow_right How does Roomcast internet co-exist with existing guest internet? The Roomcast personal area WiFi network is a simple extension of your existing guest internet. Each room has a unique and secure on-boarding process which is open within the room for sharing and streaming, but fully isolated from adjacent rooms for security. Roomcast has the option of popping up a terms and conditions window, and/or informing the PMS when a connection is opened to allow charging (requires PMS integration). With HSIA gateway integration Roomcast can be part of a tiered option whether the original opt-in or payment is made at time of or prior to joining the Roomcast network. keyboard_arrow_right What about Wi-Fi interference between Roomcast and existing access points? The wireless overhead with Roomcast is extremely low. The guest device will communicate over the Roomcast WiFi only for initial negotiation of credentials but the actual video content will be delivered over the wired connection to the Roomcast and then to the TV over HDMI. Compare this to a hotel without Roomcast where guests streaming video over the hotel wireless to their mobile devices will have a significant impact on wireless performance for other guests. keyboard_arrow_right Can the Roomcast SSIDs be hidden? The Roomcast SSIDs will only made be visible once the guest accesses the Roomcast and then only until the system times out. Outside these times the Roomcast SSID will not be visible. Roomcast does not just hide the SSID however, it turns the WiFi radio off so minimizing the Roomcast wireless footprint even further. keyboard_arrow_right What are the IR input and output ports used for? With an IR sensor connected, Roomcast can detect IR codes from popular hotel room remote controls to allow UI navigation. keyboard_arrow_right Can Roomcast be managed remotely? TeleAdapt is currently developing a management console for Roomcast. keyboard_arrow_right What are the options for customizing the User Interface? If required please ask the TeleAdapt team about customized Roomcast themes. keyboard_arrow_right What countries does Roomcast work in? Roomcast works in all countries that support Chromecast, Netflix and other popular streaming apps. Roomcast initial launch geographies include the US, UK and Western Europe.